HMH Books for Young Readers, 9780544898912, 32pp. 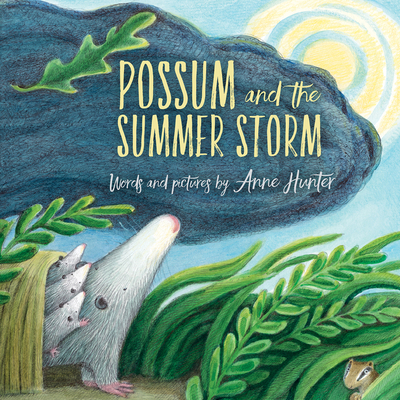 Possum calls his children out of the summer storm—but what can he do when their home is swept away by rising water? The possum family must rely on their friends to construct a new house. At first it seems that no other animal's home is suited for a possum, but they come up with something spectacular! Anne Hunter grew up in South Florida and now lives with her family in the hills of rural Vermont where she can hear the crickets, who sing with the frogs, who listen to the distant hoot of an owl. Anne is known for watching the squirrels, listening to the insects and writing about the natural world around us. She has written and illustrated many children’s books, including Possum’s Harvest Moon, which reviewers described as "a sensational selection," with illustrations that are "beautifully rendered" and have "a hushed mystery." Visit Anne at annehunterstudio.com.